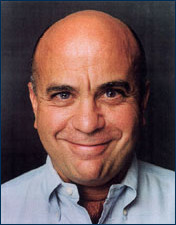 Astrologer Michael Lutin has been a star in the business, both personally and professionally, for many years. 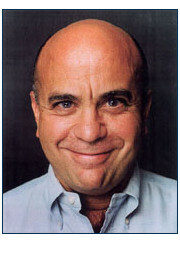 As well as pursuing his consulting practice, writing long-running columns in Vanity Fair and German Vogue magazines, and a busy book-writing and lecture schedule, he is famous for organizing and directing wonderfully entertaining and enlightening theater events, astrological and otherwise. On top of that, he is president of the New York chapter of NCGR and daily fills a marvelous website at www.wheresthemoon.com with his wit and wisdom. 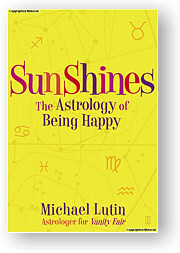 His latest book, Sunshines: The Astrology Of Being Happy, has just been published by Simon and Schuster. We spoke with him on the eve of his latest European junket, and asked how he got where he is today and what other aspiring astrologers could learn from his rise to fame and fortune as a celebrity starcaster. -- J.T. How did you come upon astrology? When I was a really young kid I lived in Europe, in Paris, and one thing led to another and I started to get interested in it at the end of high school. I was working in an art gallery and I got to know Roy Lichtenstein and I really liked his work because it distilled people down into archetypes, and at the same time I became interested in Eastern philosophy. That really was way before astrology – my interest was in just how and why people are here and what they’re doing here. So my real background came more in terms of Eastern philosophy and religion before astrology. That’s why I feel grounded in it. I don’t just use astrology for every definition of what happens to people. I’m very happy about that, that I don’t just rationalize every event, rush to the ephemeris to find out everything that’s happening every minute. Some people I met while I was living in Paris were influential philosophically, and then I got interested astrology. I don’t even know exactly how, I think it formed a natural progression. I thought for years this can’t be true, this can’t be right, somebody must have thought this up. It took me years before I finally gave in and accepted it. And then I just did. A long, long time ago…the truth is, I really don’t know. Around the time of the Doors, I remember Jim Morrison, ‘60s-‘70s. What did you major in, what are your degrees? B.A. degree in Romance languages, then a special program for French at Harvard, then I went to Yale for a PhD. program in Romance languages, but I left that. What were you doing before you were an astrologer and how did you make the transition? I was working at an art gallery in France, the only real job I ever really had, and then when I left that I went traveling around Europe. When I came back to the States I had to do something, so I started writing – I got paid so little, it wasn’t even anything – I was writing love comic books. That got paid so nothing it was just ridiculous. Then I finally realized I was going to be an astrologer. I remember exactly where it was. I was in my friend’s yellow Volkswagen on 72nd Street going towards York Avenue, and I thought maybe I should be a novelist or a writer, and then I just heard a little voice inside my head saying go ahead, finish any novel you want to write, but you’re going to be an astrologer. I just remember that moment and I was really disappointed because I just knew what a struggle it was going to be, and from then on that’s what I did. How did your career develop from there? Well, you do all your family’s charts and everyone else you’re trying to control with astrology, and then a friend would give you their friend. I studied and read everything I could get my hands on at the time. I started with the Rosicrucian Fellowship, and met Zoltan Mason who gave me a lot of books, met a couple of other astrologers I don’t even remember how. Reading, studying, doing charts, reading studying, doing charts. I did them for people and then eventually somebody gave me ten dollars to do it. Of course it took two weeks to prepare that chart and then they had to get their ten-hour reading for the ten dollars. Then one thing led to another, and I did it. I didn’t have a day job after that. I did little things – I think I went on a couple of game shows, helped a publishing company pack books, but I had no other day job. I had nothing, I starved and I went without and it was penury, a struggle for years. For many years it was a very, very difficult time, because I didn’t take money from my parents because they had paid for my education. After that I didn’t take any money from them, so I lived a very, very frugal life. It was really terrible, sometimes no lights, really terrible. But I was dedicated to it and completely focused in it. Two things happened. One was I had a friend of mine in a publishing company and they needed something quickly, and I got a job for $10,000 for three weeks, Sun-sign stuff. They were doing kind of crappy stuff, but I added to it because I’ve always been interested in solar charts as well as Ascendant charts. By then I was practicing astrology. Then one of my clients committed suicide, and I felt that I did not have enough training to recognize the signs of that. So then I really turned my attentions to studying psychology and being trained in a certain branch of psychotherapy, so that I could combine it and never have that happen again. It’s called communicative psychoanalytic psychotherapy, it’s a school by Robert Langs, M.D. He devised this. It’s a very interesting way of dealing with patients and clients that allows the patient and client to control the flow of the session, whereas before it was all the astrologer performing the session. That changed my life, and it happened at the same time. That’s something everyone ought to know and take notice of. Well, everybody has a different thing, that’s the thing. It’s a big split in our community. You have certain astrologers that believe that we are not therapists and we shouldn’t try to pretend to be therapists, that we are divinatory practitioners. They have their valid point of view. I felt personally that I should have recognized the signs of this guy who was a wonderful little person, really wonderful and either refer him out to someone who has more training than I do or get more training. I cannot recommend that for other people and I cannot tell people how to direct the course of their lives or their calling. Because one of the things I think is that astrology is not a profession. I don’t think that regular, professional tricks like advertising work for an astrologer. I always think about it when I see a well-known doctor’s advertising in the subway. I don’t think I’d go to a plastic surgeon who advertises in the subway. I think that people get the idea that for us to be more professional means that we have to dress for success and advertise. It’s never worked for me. I think that we’re involved in a calling. We don’t choose astrology as a profession, it chooses us. So I think that each person has his or her own way of following that path, which I respect. There are people who – like Bob Schmidt, Lee Lehman, Rob Hand –are much more interested in Medieval stuff. They don’t care to do therapy on people. They want to read the chart as they see it, and I think it’s valid. Vedic people, horary people also. Horary is valid, financial is valid. It’s not the path that I went on, because it occurred to me that I was not just an empty vessel through which the Holy Ghost of Astrology passed – I was affecting people’s minds. So that’s the road I took. Lutin's latest book, Sunshines: The Astrology of Being Happy is about the relationship of the Sun sign and the lunar nodes. After the first Sun sign job you mentioned, how did you progress into the publishing area, becoming a writer as well as a practitioner? One of the things people most admire is your wonderful ability to write, to phrase, to perk people up, to catch the reader. I started out writing the regular, serious astrology stuff, in a very astrological way. Then when I met my first real editor at a magazine, I remember him saying “I don’t want you to just write, I want you to write the way you talk to people and make them laugh.” And then I just stopped being a writer and started being a communicator. I don’t write anything, I talk to people on paper. That’s the only secret I can give any other writer. First of all, always write about what you’re thinking about, don’t try to write about something you’re not thinking about, because there’s no such thing as a writer’s bloc. Suppose you have an assignment to write for, say, Mountain Astrologer, on transiting Chiron in Aquarius, and somehow you can’t do it. It’s not because you can’t do it, it’s because you’re not thinking about that, you’ve got something else on your mind. I always advise people to write what’s on your mind, even if it’s, “I can’t write, I’m mad at my grandmother, my dog is sick.” Whatever is on your mind, write that, and it will lead you into the assignment. That’s all I do, I never write. People say how can you write so much? When you want to talk to people, you just talk to them on paper. It’s not like being some genius writer. I must admit, I’m doing some volunteer work for my old grade school up in Connecticut, the Rawson School, and you know what – they don’t even teach grammar anymore. They don’t teach nouns – the computers I guess do that and it’s all some sort of phonics stuff, who knows – but I remember from the first grade I wrote my very first book, it was called “My Book.” I had a public school education, but it was such a wonderful education. I was never a good writer, I don’t think I was a truth-teller in those days, but I remember I had excellent foundations in grammar and sentence structure. Like who diagrams a sentence today? They don’t even know what a sentence is. When I went to Trinity – that was a fancy, private Episcopal school – in freshman English I didn’t know what the hell he was talking about, but boy did I learn. My teacher’s name was Dan Risden. I remember all my English teachers – those people have such an effect on children, for the rest of their lives. So I credit a lot of that to the foundations of the language. Well, people often speak of astrology as a language – some consider it a structure that’s very one and of a piece with the language in which it’s expressed. That’s a good point that you bring up. When I was younger, before I even knew about astrology, I always liked languages. I was a Latin student, fluent in Spanish when I was fourteen years old, then became fluent in French. I loved Italian, even studied Russian. I always wished I could find a language that everybody could understand. Then I found astrology, and it’s great. I went to Russia once to do a conference, and I’ve been to Turkey as well, and the languages there are so completely different. But all you have to do is put Sun-trine-Jupiter, Venus-square-Mars on the blackboard and everyone in the room understands you. It’s wonderful. They understand it. That’s one of the other great things about astrology, it unifies you with other human beings. Not everybody, because not everybody is supposed to do astrology – not everybody should be astrology-minded – but those who do are linked all over the planet. I love that. For Vogue in Germany? I don’t remember. They called me up, I guess. Vanity Fair, twenty-two years. Aside from the therapy and language aspects of astrology, do you think there is a physical basis for it? When it comes down to it, what is it, really? It’s as much a mystery to you as it is to me. Sometimes it’s a solid, sometimes it’s liquid, sometimes it’s a gas. There’s a solid part to it, a liquid part to it, and there also a lot of outer planet stuff that forces you to be completely open to every possibility of manifestation in order for you to be an astrologer. You can’t be looking only for the scientific, you simply can’t. Is there a scientific aspect? Of course, we know there is. We know Saturn is slowing down to go direct, and we see its effect and it’s indisputable if you’re an astrology person. Whether its synchronistic and we’re all part of it, or it’s something connected with our hypothalamic-pituitary complex, who knows? But in November you could have said in early April we’re going to turn around and the stuff that was slowing down is going to speed up, and I think you’d be right. And since we’re not psychic, there’s definitely some sort of scientific connection to it. But, then comes in the metaphysics. What does it mean? Why does it mean it? Why are we connected to it? What the hell are we here for? You come up with the questions that nobody’s ever answered. Love certainly has something to do with it. Learning about attachment and non-attachment seems to be something universal for every human being. Apart from that, I wouldn’t even venture a guess, except that anybody who has ever seriously investigated it has never escaped it. But we’re a community of people and we don’t belong to the rest of the world, because once you step into metaphysics in any profound or deep way, and once you commit yourself to this life, you’re never going to completely be in their world again. In your career, what was your best move, your worst move? Do you have things about which you say “God, if I’d only done that I’d be in a totally different place”? Well, I can’t tell you my worst mistake, because it’s too embarrassing, but I’m paying for it now. On my best days I think by best move was to discover astrology, on bad days I think it was stupid. But you mean best business moves, professional moves? Yes, because people coming into the profession want to know how to do it right. It’s one thing to be interested in astrology even as a calling, another to make enough at it so you can spend all your time attending to that. I would say one of the things you want to always do is have love and respect for the people who are going to buy your service, even though they may have a completely different philosophy or lifestyle from yours. I think the urge to communicate when it’s tempered with respect for people’s distance helps. We all want to communicate astrology to people, but we have to be open to those who are open to us and not chase people. Each one of us has a different audience. Rick Tarnas published a book called Cosmos And Psyche, and Rick Tarnas’s IQ is about 467. Rick Tarnas speaks to philosophers and people of consciousness – he is not speaking to people who read TV guide. So Rick knows his audience. When you’re in his presence, you’re in the presence of a person with a gigantic mind and a love of people, but he doesn’t try to be a fortune cookie. So with each person. My skill was developed because I was always the class clown – I was voted that in high school. I was always putting on shows, making light of things, probably to cover up my own death anxiety. Therefore it was natural for me to develop a writing style that was at once idealistic and cynical at the same time. So I think you have to know your audience, find your audience, be completely committed and believe in prosperity and bounty, the bountifulness of things. Well, I don’t know if I really believe in those things. There were moments when I just thought “I’m too old to get a job!” I remember saying that to myself so often. “Oh my God, I’m too old to get a job! What am I going to do? I’m too old, I can’t even decide to go get a job.” But I had to keep on moving forward. I think one of the pitfalls of our colleagues is feeling removed from the world. I didn’t turn to metaphysics when things were going wonderful in life, and I don’t think people do. You know, you don’t get a client who just won the Oscar, you get the client who didn’t get the Oscar, know what I mean? A lot of people in our community moved away from the world because the world was incomprehensible to them. I think we all did. Raised in families that we didn’t fit into, a big common thing. Of all the things you do, is there one where you either enjoy it most or make the most money? First, I love it all, and if I did it for the money I wouldn’t be an astrologer. I love doing all the shows we’ve done at conferences – so fun, and all meaningful even though a lot of the meanings were hidden. I love writing for magazines, I love writing books, I love my clients, I never get tired of them. I get physically tired, exhausted from working, but I never get tired of. And what brings the most money? That’s hard. I mean, some people out in the real world would say that no money we make is real money. If you have an overhead of $30,000 every month, they don’t think it’s a lot of money. So it’s all relative. What do I make the most money at – I think I do a lot of things to make my overhead. I don’t like to depend on my clients for the money, because they can feel it, and that’s why it’s nice that I can do some other things. You do as much as you can. But I would advise astrologers if they’re going to be a practitioner is to get training of some kind, both in terms of counseling and of course astrology training or certification, as much as they can get. Then I would advise them to develop speaking abilities and speak for groups, to write articles for your magazine and Mountain Astrologer and other venues, because it is going to be what people read that you wrote that they can apply to themselves that will draw them to you, and not advertising. It’s all about content, then? Yes. Don’t tell me you’re a great astrologer. Write to me something about Mars transiting Gemini that I can think “Oooh, that’s right” and that will connect me to you – each astrologer gets the people whom he or she is supposed to have, because every client we have teaches us something more. We can impart things to them, but every client we have teaches us. Well, I’ve just finished a book called Sunshines: The Astrology Of Being Happy. It’s with Simon and Schuster and will be out in the fall. I’m really excited to death about that, and I have a couple of other projects that I’m working on now – one is an Internet project, the other a broadcast project, and I have another book I would love to do soon.